Presenting the much awaited trailer of Phantom! 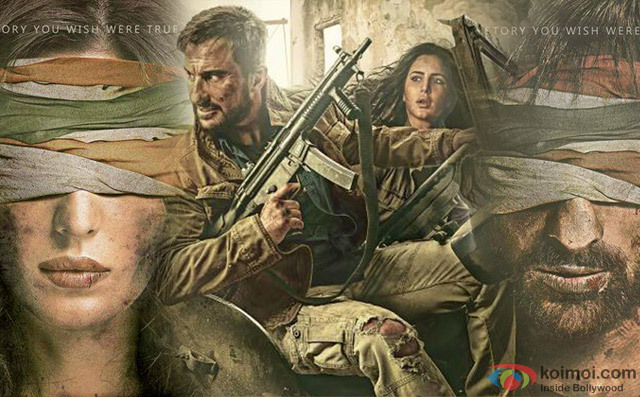 The film, directed by Kabir Khan stars Saif Ali Khan and Katrina Kaif. Phantom is a political thriller set in the volatile climate that exists in South Asia. Constant terror attacks against India have left the Indian people feeling vulnerable and angry. The Indian government and security agencies are helpless as the masterminds of the attacks are out of reach. When an infiltrator with plans to attack India is caught, the Head of India’s security agency and his team take matters into their own hands. The film follows the protagonist Daniyal, whose journey to seek justice takes him to India, Europe, America and the volatile Middle East. Local assets in various countries help Daniyal, including Nawaz Mistry who works for an American security agency. Daniyal and Nawaz are drawn into a battle of wits with a shrewd and ruthless enemy. With the enemy hot on their heels, Daniyal and Nawaz against all odds try and finish the job they had set out to do. Along the way they find out that in a mission like this there is always a price to pay, in this case a very personal price. In theatres Aug 28th 2015. The Idea is Nice however it will negatively effect on India and Pakistan relations how can a same director make two movies which is opposite each other. It will fadu movie Jabardast dialogue and baby movie style. Join 100 crore movie in 10 days…. great movie trailer……. I thought Khabir khan can do better then negativity brain wash movie, for Saif I am not surprise ,he would take any movie coz he is a Flop hero. This is a movie about the terrorists(26/11) who are in the Pakistan,and ghar main unko marne ki bat,,hai.Why u all are taking it personal? Can’t deliver a dialogue properly. The films seems to be to much cliche. Why the India Director make the opposite move about Pakistan people. You can close relation ship Pakistan and India people why? This movie was Flop of hero Insha allah movie about 70 core.